This image from the 1800s shows a portion of the museum on the third floor of Science Hall, on Indiana University's early campus at Seminary Square. Indiana University plans to build a replica of an ancient giant sloth skeleton that was once housed on the Bloomington campus. The project is intended to teach people about a creature that roamed this area thousands of years ago and shed light on an unfortunate decision in IU’s history. “It’s a mixed tale of regret and loss, but it’s also a promise for better care for our collections across the university system as we move into our third century,” said Gary Motz, assistant director for information services at the Indiana Geological and Water Survey. Megalonyx jeffersonii was an ice age mammal that roamed, among other areas, what is now Indiana. It’s closely related to the two-toed sloths that live today, but was much larger. The skeleton being replicated is 10 1/2 feet tall, Motz said. A thick, muscular tail is believed to have been used to form a tripod, helping the animal reach leaves and twigs on trees. The animal gets its name from Thomas Jefferson. The third president was interested in paleontology. When a friend sent him some bones found in a cave, Jefferson mistakenly believed they belonged to a large cat and named the creature megalonyx, or great claw. They were actually the remains of the claws of an ancient ground sloth. Later, Jefferson was credited with discovering the sloth, leading to the addition of jeffersonii to the creature’s name. David Dale Owen, Indiana’s first state geologist, found one of the most complete megalonyx jeffersonii skeletons in the 19th century along the banks of the Ohio River. 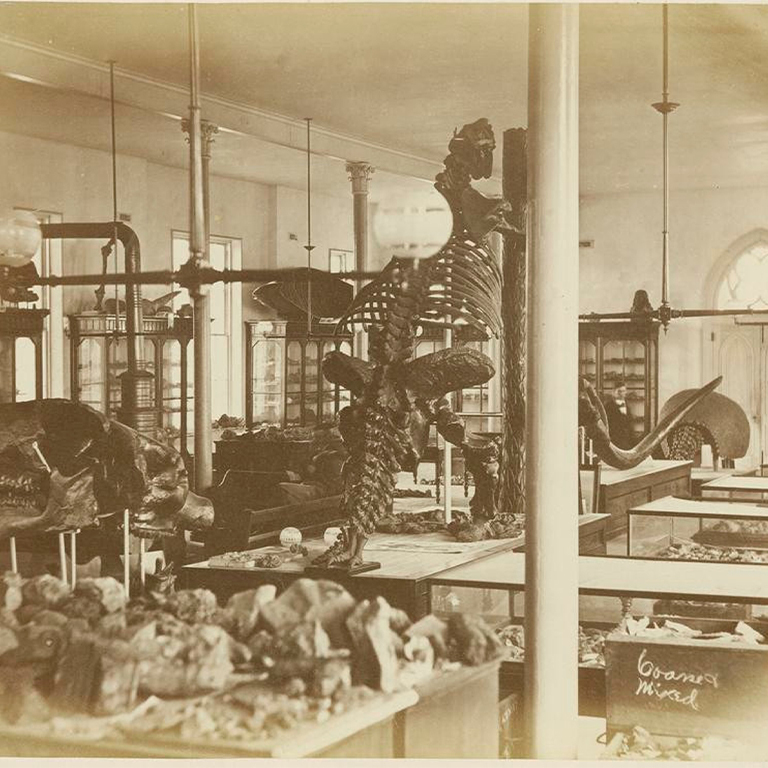 When Owen died in 1860, his brother, also a state geologist, sold the skeleton to IU, forming the basis of the university’s natural history collection. Enrollment at IU and universities across the country exploded after World War II. In need of space, the sloth’s skeleton, along with those of a mastodon and a mammoth, were discarded. “According to some alumni records in the IU archives, they were thrown out a window,” said Polly Root Sturgeon, outreach coordinator at the Indiana Geological and Water Survey. A zoology professor named Georg Neumann recovered five of the sloth’s bones from a pile outside Owen Hall. They were stored in the IU Anthropology Museum, now the Mathers Museum of World Cultures, before going to the Indiana State Museum in the 1980s. Sturgeon and Motz recently went to the state museum to scan the bones to build a replica of the skeleton that has come to be known as megajeff. Digital files from those scans will be combined with information about the skeleton’s other bones. Before the giant sloth’s skeleton was discarded, it was sent to the Academy of Natural Sciences in Philadelphia for a paper published by the Smithsonian Institution, Sturgeon said. Copies of the five remaining bones, along with the animal’s skull, will be made this summer at the IU Wells Library 3D Print Lab. The rest of the skeleton will be made from laser cut recycled cardboard. That process will begin this summer at the IU Eskenazi School of Art, Architecture + Design Makerspace for Art and Design Labs. The combination of cardboard and plastic is intended to be jarring. The IU Office of The Bicentennial funded the project with a $25,000 grant. The replicated skeleton will be part of a traveling exhibit that will go to all of Indiana’s 92 counties starting in August as part of IU’s 200th anniversary celebration. Eventually, it will return to Bloomington. Sturgeon hopes the project will bring awareness to an unusual story.